Reading Leslie’s writing at the whole plate and seeing Luke’s and Natalie’s photos at him + her inspired me to write about the small things that bring me joy in Bangkok. I’ve been working a lot and feeling dull. It has been too long since I’ve posted. 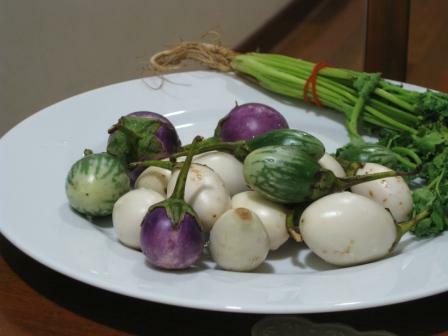 I’ve fallen in love with mini Asian eggplants. They are full of tiny seeds. Once fried, they burst with flavor. We live a couple of blocks from a beautiful fresh market with so many vegetable choices. Each day I have to resist coming back to the apartment with arms full of cabbage, cilantro, okra, basil, and green, yellow, and red chilis. We arrived in Cape Town nearly two weeks ago and found a quaint neighborhood to reside that is close to a good string of restaurants on Long Street. Cape Town’s neighborhoods creep up hills against Table Mountain in the center, each of the homes seeming to jostle others for a better view over the city, mountain, and harbor. It is a great location for hiking, beach living, and city life and has a positive vibe in general. There are good culinary options due to such a mixed population of races. One of our first side trips was to see the Cape Point nature reserve and to take a rail car to Cape Point. No matter where we live, my favorite comfort recipe is chocolate banana bread. It has to be the most simple and quick dessert to prepare. After bringing a loaf to a get-together in Buenos Aires, the girls asked me to e-mail the recipe in Spanish. It took me a while to get around to translating it, but I finally sent it out. Please let me know if you make it! Special thanks to my friend Melissa who is the world’s best banana bread baker. The following English and Spanish translations were inspired by a recipe on Elise.com. Gracias a mi amiga que se llama Melissa quien es la mejor chef de budín de bananas y chocolate. La receta que viene fue una inspiración por una receta de Elise.com.